This is the 3rd installment in my responses to Jeremy Fox’s questions about the LTEE (my lab’s long-term evolution experiment with E. coli), which he asked at the Dynamic Ecology blog. This response addresses his 2nd and 7th questions, which I’ve copied below. I like all of Jeremy’s questions, but I especially like his 2nd one because it forced me—and many readers, I hope—to think carefully about what experiments are and why we do them. Is the LTEE actually an experiment, and wouldn’t it have been even better if it was? It’s just one “treatment”–12 replicates of a single set of conditions. Wouldn’t it have been even more interesting to have, say, two treatments? Two different culture conditions, two different founding genotypes, two different founding species…? Is the LTEE itself now a “model system”? Model systems in biology–systems in which it’s tractable to ask a given question–often are systems that we know a lot about. We can leverage that background knowledge to ask questions that otherwise wouldn’t be tractable. coli of course is a model organism for many purposes, because we know so much about it. But is the LTEE itself now a model system? You’re certainly right, Jeremy, that experiments in the fields of ecology and evolutionary biology typically have two or more treatments. But it’s not an essential part of the definition of an experiment that it has that sort of structure. It would have been nice, perhaps, if the LTEE did have two or more environments and/or two or more ancestors, as you suggest—in fact, we’ve run several of those types of experiments over the years in my lab, and I’ll mention a few of them below. The reason I didn’t do that with the LTEE, though, was because one of my core motivating questions (see part 2 of my response) concerned the repeatability of evolutionary dynamics across replicate populations. That’s a question about the trajectory of variances over time, which is challenging statistically because estimates of variances have large uncertainties. So if the LTEE had two treatments, I might have been able to say something meaningful about the differences between them, but I would have had less power to say anything about the among-replicate variances for either treatment. In other words, with respect to that motivating question, going from 12 replicate populations down to 6 replicates would have been risky. It certainly would be nice to have more total populations, say, 24 or even more; and nowadays many labs use 96-well plates for evolution experiments, with each well a replicate population and liquid-handling robots to automate the transfers. When I started the LTEE, though, we worked with flasks (albeit small ones); 12 may not seem like too many, but when we run the competition assays to measure fitness, we then have replicate assays for each population and we analyze multiple generations simultaneously, so the students and postdocs running these assays are handling many dozens or even hundreds of flasks. Stepping back a bit, I’d like to suggest that the LTEE is a sort of meta-experiment, to coin a term. (This idea echoes the question where you suggested that the LTEE has itself become a model system.) By “meta” I mean the LTEE transcends—goes above and beyond—what one usually considers an experiment because the LTEE enables experimentation at several levels. First, it is an experiment in the sense that it set out to measure, under defined conditions and with replication, certain specific quantities, such as fitness trajectories. It may not be typical in having a single treatment, but the temporal dimension coupled with being able to analyze multiple time points simultaneously—that is, the “time travel” enabled by the frozen samples across the generations, including the use of the ancestral strain as an internal control in fitness assays—functions in much the same way from an analysis standpoint. Second, the LTEE has generated a number of new questions and hypotheses that are themselves amenable to structurally independent follow-on experiments. Let me give two examples. We observed fairly early on that several populations had evolved changes in their DNA metabolism and repair that caused their mutation rates to increase by roughly 100-fold (Sniegowski et al. 1997). Such “mutator” mutations can arise by hitchhiking, albeit only occasionally and stochastically, with beneficial mutations that they cause (Lenski 2004, see pp. 246-251). It wasn’t clear, though, whether they would necessarily increase the rate of fitness improvement, given the large populations and correspondingly large potential supply of beneficial mutations in the LTEE. So we designed a separate, shorter-duration experiment with some 48 populations where we varied the mutation rate, population size, and initial fitness of the founding ancestor, and assessed the resulting fitness gains over 1,000 generations (de Visser et al. 1999). Another case is the “replay” experiments that Zachary Blount ran after one lineage evolved the ability to grow on citrate in the presence of oxygen, which E. coli generally cannot do (Blount et al. 2008). Zack ran thousands of populations that started from genotypes isolated at different times from the population that eventually evolved this new function, in order to test whether it could have arisen at any time by an appropriate mutation or, alternatively, whether it required first evolving a “potentiated” genetic background, or context, in which the “actualizing” mutation would then confer the citrate-using phenotype. In both of these examples, the subsequent experiments, though separate and distinct from the LTEE, nonetheless emerged from the LTEE. That is, the questions and hypotheses tested in these later experiments were motivated by observations we had made in the LTEE itself. The third level of the meta-experiment involves questions that arise outside of the LTEE, but for which the LTEE generates a set of materials—specifically, strains—that are especially useful for experiments to address those questions. Again, I’ll give a couple of examples. Many ecologists, physiologists, and others are interested in studying adaptation to specific environmental factors—such as resource availability, temperature, etc.—as well as examining possible tradeoffs associated with adaptation to those factors. One difficulty, though, is that by moving organisms from nature into the lab and allowing them to evolve under, say, different temperature regimes, adaptation to the shared features of the lab environments may well outweigh adaptation to the specific variable of interest. If so, that would interfere with one’s ability to identify the mutations and adaptations most relevant to the factor of interest, and it could also obscure tradeoffs that might be important if populations were already well adapted to the other aspects of the environment. With these considerations in mind, Albert Bennett and I took a strain from the LTEE that had evolved in and adapted to those conditions—the resources, pH, absence of predators, etc.—and we used it as the ancestor for a new evolution experiment where 6 replicate populations evolved under each of 4 different thermal regimes: 32C, 37C (the same as in the LTEE), 42C, and daily alternations between 32C and 42C (Bennett et al. 1992, Bennett and Lenski 1993). In that way, we could focus attention on temperature-specific adaptations, which were Al’s main interest, rather than having such changes overwhelmed by adaptation to the lab environment. My second example where LTEE-derived strains were ancestors for an experiment meant to address an extrinsic question is one of an abstract nature. In this study, we quantitatively partitioned the effects of adaptation, history, and chance on phenotypic evolution by founding 3 replicate populations from 12 different ancestors—each one a genotype sampled from a different one of the LTEE populations—and we then let these 36 populations evolve in a new environment, where we changed the identity of the limiting nutrient (Travisano et al. 1995). By measuring the fitness of the 12 ancestors and 36 derived lines in the changed environment, we were able to disentangle and quantify the relative contributions of adaptation, history, and chance to the observed outcomes (see figure below). 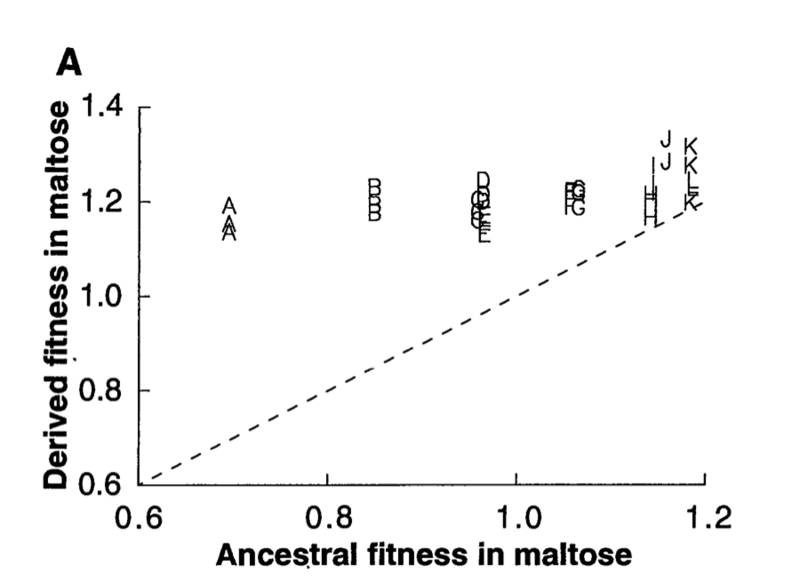 That is, adaptation measured the mean tendency for fitness to increase, history reflected the effect of the different starting genotypes on the fitness gains, and chance the variation in fitness gains among the replicates that started from the same ancestor. Sniegowski, P. D., P. J. Gerrish, and R. E. Lenski. 1997. Evolution of high mutation rates in experimental populations of Escherichia coli. Nature 387:703-705. Lenski, R. E. 2004. Phenotypic and genomic evolution during a 20,000-generation experiment with the bacterium Escherichia coli. Plant Breeding Reviews 24:225-265. De Visser, J. A. G. M., C. W. Zeyl, P. J. Gerrish, J. L. Blanchard, and R. E. Lenski. 1999. Diminishing returns from mutation supply rate in asexual populations. Science 283:404-406. Blount, Z. D., C. Z. Borland, and R. E. Lenski. 2008. Historical contingency and the evolution of a key innovation in an experimental population of Escherichia coli. Proc. Natl. Acad. Sci. USA 105:7899-7906. Bennett, A. F., R. E. Lenski, and J. E. Mittler. 1992. Evolutionary adaptation to temperature. I. Fitness responses of Escherichia coli to changes in its thermal environment. Evolution 46:16-30. Bennett, A. F., and R. E. Lenski. 1993. Evolutionary adaptation to temperature. II. Thermal niches of experimental lines of Escherichia coli. Evolution 47:1-12. Travisano, M., J. A. Mongold, A. F. Bennett, and R. E. Lenski. 1995. Experimental tests of the roles of adaptation, chance, and history in evolution. Science 267:87-90. Dr. Lenski is an evolutionary biologist. He writes about evolutionary science – past, present, and future – and some of the goings-on in the life of a scientist.